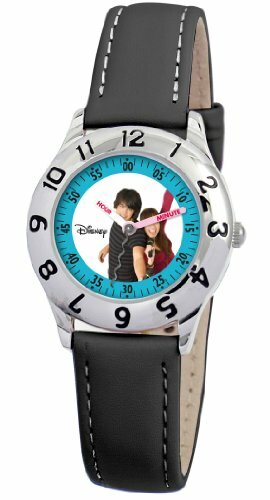 Your young singer will love learning to tell time when Shane and Mitchie from Camp Rock are involved. 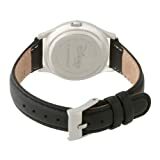 The Disney Kids’ Camp Rock Shane and Mitchie Time Teacher Watch offers cool features and helpful aids that make your child want to learn. The white hour hand and pink minute hand are clearly labeled, and the second hand has an easily distinguishable, curvy, shape. 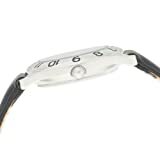 Large, black, Arabic numbers on the round, metal bezel make it simple to match the hour hand with the right number, and distinct, black, Arabic numbers mark the minutes on a blue, outside track. The genuine black leather strap features detail stitching and fastens with a secure buckle. 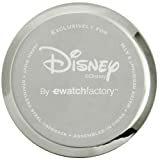 Quality quartz movement, a protective, mineral crystal, and a water resistance of 99 feet (30 meters) define this durable and fun rocker’s timepiece from Disney.